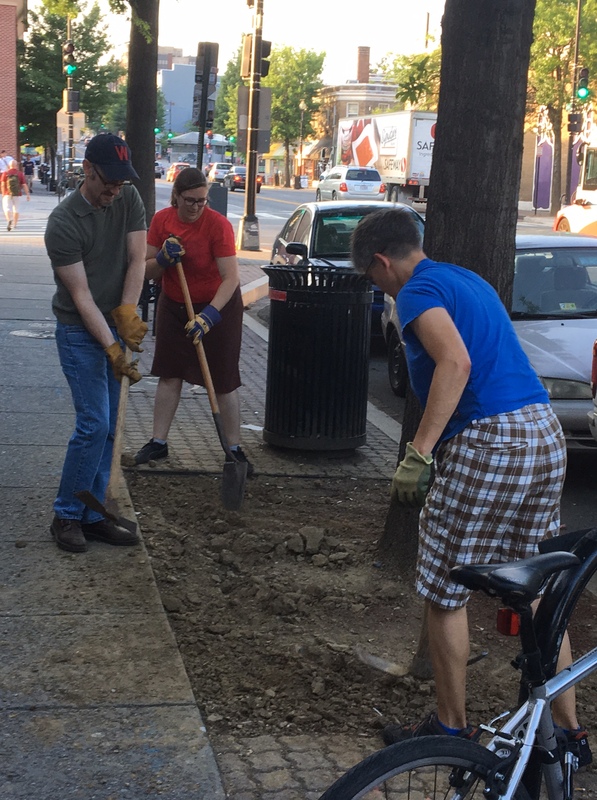 First Tree Box on Georgia Avenue Gets Flowers | Park View, D.C.
Digging into the hard, backed soil in front of Walters. 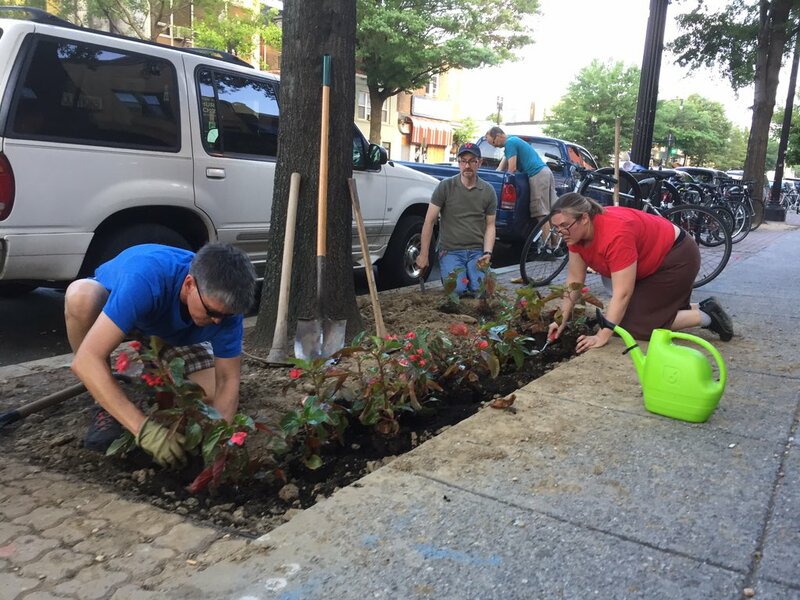 On Thursday night, June 15th, Commissioner Boese with volunteers from Georgia Avenue Thrive planted begonias in the tree box in front of Walters Sports Bar (3632 Georgia Avenue). Prior to the event, Annie’s Ace Hardware set aside the flowers which Boese provided. EatsPlace also provided lemonade for the volunteers. I can tell you it was a lot of work. The soil was clay and compacted making digging with a shovel impossible, so a garden mattock was used. Once enough of the hard, clay soil had been loosened up, mulch was used to help amend he soil. After that the begonias went in. While the project is largely done, additional much will be required. Fortunately, there is already mulch available. There were a number of lessons learned from the effort, the primary one being that the tree boxes on Georgia are composed primarily of compacted clay with is very difficult t dig into. This entry was posted on June 16, 2017 at 7:01 am and is filed under Community Involvement, Volunteerism. You can subscribe via RSS 2.0 feed to this post's comments. Your beautification efforts are much appreciated! Count me in for the second one – I recently found my not-yard was a clay brick as well, though I pounded through (most/some) of it with a metal digging bar (25 lbs?). I could contribute that effort to the next baked brick barrier. Without anything to protect people from stepping on those flowers (e.,g., a low fence) I fear for their longevity. But mad props though! !